Some members of the Manhattan Mah Jongg Club have played for half a century; others are novices. 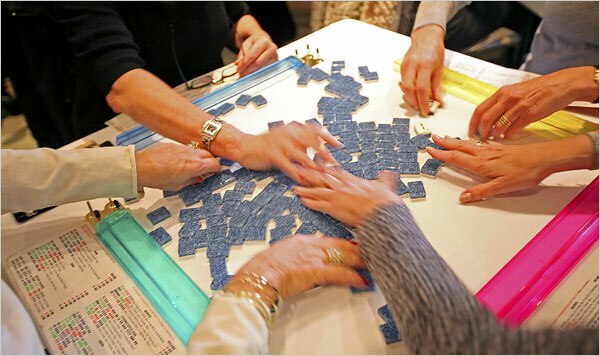 THE women of the Manhattan Mah Jongg Club know when to quiet down. When chatter about weekends and grandchildren threatens to drown out calls of cracks, bams and dots, Linda Feinstein, the group’s leader, puts a lifeguard whistle to her lips. Her passion for the game stems from watching women play on the porch of a neighbor’s Coney Island bungalow on summer evenings in the 1950s. At the East River Cafe, on First Avenue and 61st Street, where about 80 women meet every Monday, she fielded questions from beginners and resolved squabbles among intermediate competitors. Mah-jongg is serious business here. After lunch, participants, on occasion this reporter, spend hours vying over 25-cent and 35-cent hands, with the winner receiving the hand’s value from each of the other players. The roster draws from nearly 300 regulars, mostly from Manhattan. Some competitors have played for more than half a century; others are novices; nearly all are Jewish. Many took up the game after finding old sets belonging to mothers or grandmothers. The play ensued briskly. “Two dot,” called the woman to her right. Copyright © 2009-2018 - Linda Feinstein - All Rights Reserved.